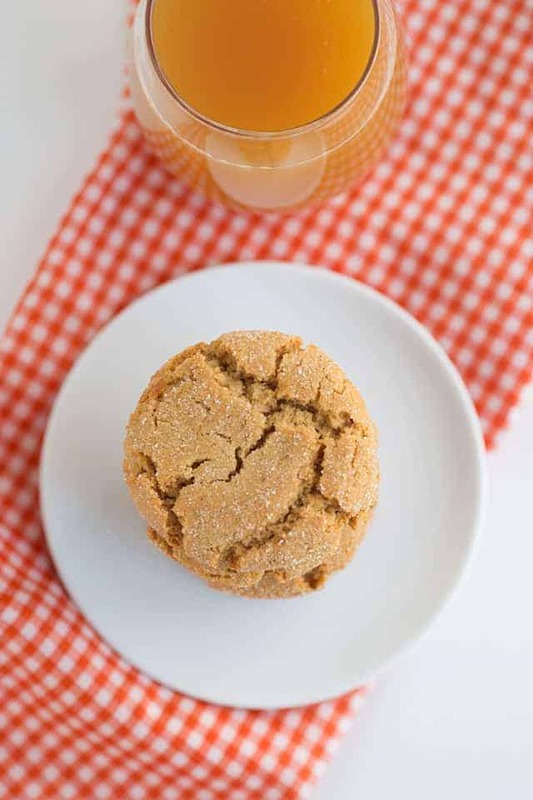 These apple cider snaps are perfect for Fall. They have crunchy edges, soft center, and great for dipping in some hot coffee! 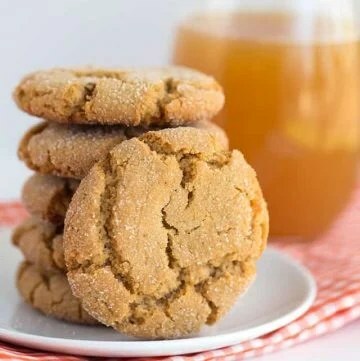 They’re sort of like a ginger snap mixed with a molasses cookie and has a little apple cider thrown in. They’re totally unique and taste AMAZING! For the creative cookie exchange, the theme was apples. I happened to have a half gallon of apple cider in the fridge. So, I went to work with writing down ideas and ingredients. Before I knew it, I had jotted down a recipe for apple cider snaps. To make my snaps, I had to make some apple cider molasses. It was a timely recipe, but definitely worth it. These cookies are amazing and full of spicy apple flavor. They definitely shout fall. I love it. My son has just started really enjoying apples. What a perfect time to do so too. I’ve only let him have a few sips of the apple cider because that could be a terrible mess, but I just introduced him to apples and peanut butter. Like myself, he found them heavenly. I came to this conclusion by the loud MMMMMM after every bite he takes. Gosh, he is so cute. I love the cracked look of these cookies. They have a great snap to them but are also chewy. They are a beautiful golden brown color and coated with a dusting of sugar before they are baked. Seriously, you have to put the time in and make these. Also, did them in some coffee. I’m in love. For me, it’s apple cider that’s been cooked down into a thick, syrupy molasses. It can really take some time and patience to get it to the molasses consistency. So if you’re wondering about boiled apple cider, it turns into a molasses. 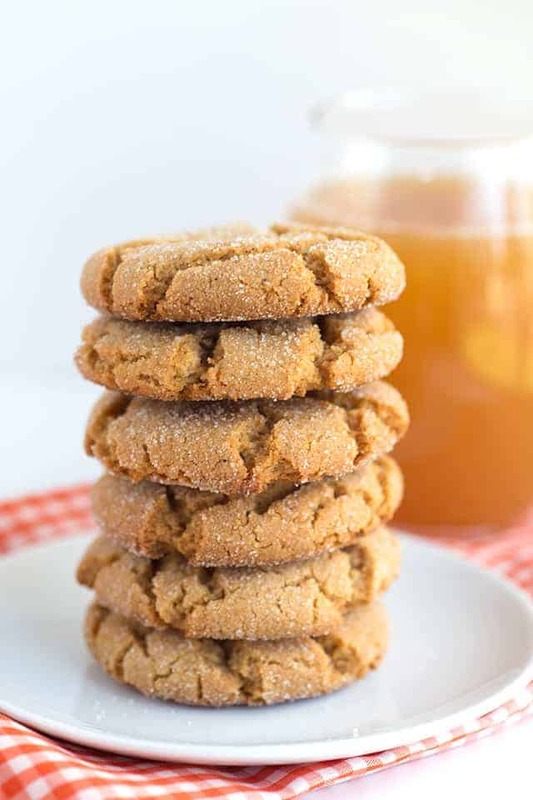 The apple flavor gets super intense which is great because you don’t have to worry about added a large amount to the cookie recipe and making it runny. So my apple molasses recipe comes out to make the perfect amount for this apple cider snap cookie recipe. You obviously don’t need to make the cookie if you just want the molasses though. To make apple molasses, start by adding 4 cups of apple cider to a saucepan and simmering it on low heat until it looks like molasses. If your heat is too high, you will probably end up with a scorched pan or rock hard molasses. Keep it low and slow. It doesn’t really need a lot of hands-on until the last 30 or so minutes. Then stir pretty often until it looks about 1/3 of a cup. If you plan on adding the apple molasses to the apple cider snaps, line a bowl or measuring cup with tin foil or plastic wrap. Spray with a cooking spray and pour the molasses in. Let it cool in the fridge. When you’re ready to use it, just turn it out into the cookie dough and it releasing perfectly. There’s no need to try to scrap the bowl for every last bit of apple molasses doing it this way. 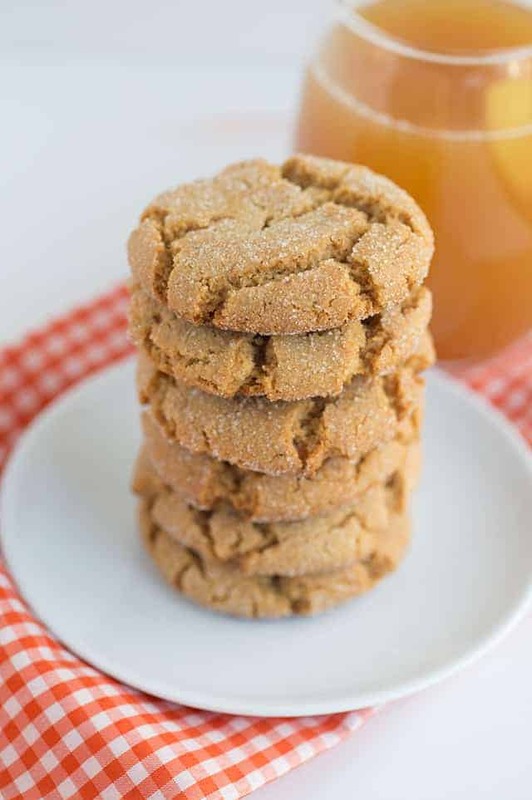 Crunchy edges and soft center, these apple cider snaps are addicting! 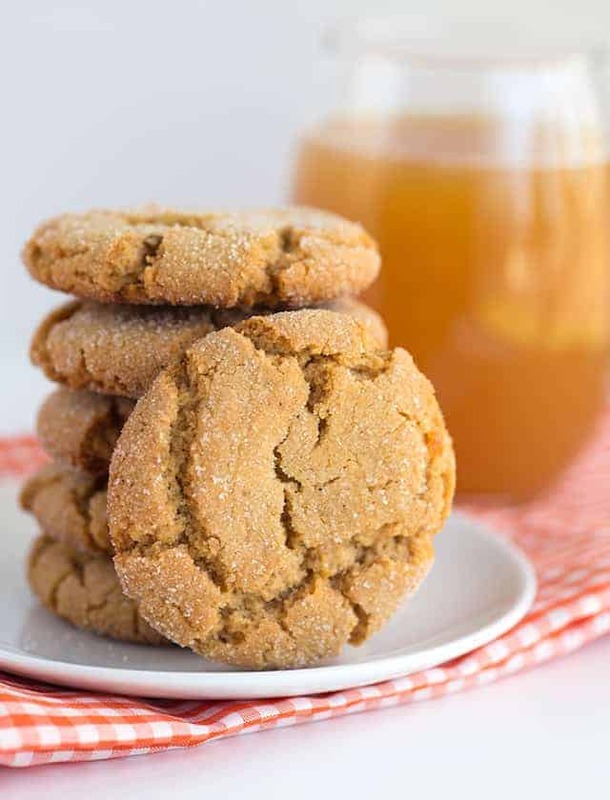 They are tangy, full of apple flavor, and have all the spices a molasses cookie should have! Place 4 cups of apple cider into a saucepan. Heat the cider to a boil over medium/high heat. Once the cider comes up to a boil, reduce heat to medium/low. Let the cider simmer until it reduces to a thick molasses. Mine took 3 - 4 hours to cook down. It doesn't need much attention until the last half an hour when the cider has cooked down substantially. Then stir often to avoid burning. Just cook it down to 1/3 of a cup and let it sit at room temperature as you prepare the cookie dough. In a large bowl, add in vegetable oil, brown and granulated sugar. Mix on medium until combined. Add in the eggs and cider molasses and mix on medium until incorporated. In a separate bowl, sift all the dry ingredients. Pour them into the wet mixture and mix on low until combined. Scoop the dough and roll into the 1/4 cup granulated sugar. Place on cookie sheet. Space them 2" apart. I only had 6 scoops on my cookie sheet. Bake for 14 minutes until golden brown. Let them cool on the baking pan about 5 minutes before trying to move them with a spatula onto a cooling rack. Move to the cooling rack and let them finish cooling. This recipe was first posted October 15, 2013. I would love to have those cookies right away! Just “tried” to make the apple cider cookies and mine did not turn out at all like the picture. They are flat and really too much trouble. I just added a bit more flour and chilled the dough, so we will see if that helps. I won’t be making them again. Oh no. I’m so sorry they didn’t turn out like the picture. It sounds like maybe the cider molasses wasn’t thick enough. I still have my mom’s gingersnap recipe that I make every year. I have not had a version made with apple cider. What an interesting addition to the recipe ingredients. I will have to give this version a try too. It really is quite an interested addition! Woah! I didn’t know that you could boil apple cider down that much! I wonder what would happen if you started with a concentrate. I looooove apple cider but sometimes we buy more than we can drink- this would be a great way to use it up! I absolutely love the look of these cookies — they are absolutely perfect and that crinkled top with sparkly sugar makes them so inviting. We do a cookie swap every year and everyone is trying to one-up the other — I think these could my new secret weapon. Love the sound of the apple cider molasses, too. Bet it would be good just spooned over ice cream. Wow I have never heard of apple cider molasses before. I love this idea. I bet your house smelled lovely while it was cooking down. Your cookies look beautiful with all of those cracks, i agree. Love this idea, saving for later. This will be super fun to do with my daughter. Thanks for sharing your recipes! I loooove fall because of apple cider. These cookies are going to be my new favourite because hello, apple cider snaps? The crackly top on your cookies are perfect as well! I can’t wait to get a batch of these in the oven (and of course freeze a few for the rest of the year haha). Oh my gosh it’s SO fun introducing little ones to new flavors! What a great cookie to make with him when he’s old enough. Cooking memories are the best – especially when they involve amazing cookies like this! Holy cannoli these are amazing! 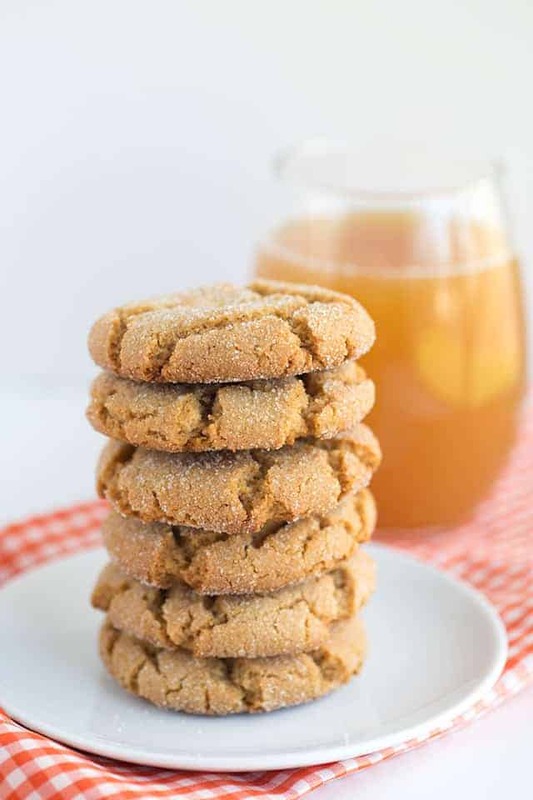 I’ve always loved ginger snaps, and I’m a total sucker for apple cider *everything* (pumpkin spice has got nothin’ on spiced apples). These cookies are perfection. Those cookies look beautiful. Great idea to boil down the cider into a syrup of concentrated flavor. Looking for something a bit different for the neighborhood cookie swap. I think this is it!! I have never heard of apple molasses before, but I definitely have to try out this recipe to see what it’s all about. The cookies look incredible! The spicy mixture looks like it will definitely compliment the apple molasses. Oh my, these cookies are just the perfect treat for the Fall season. From the apple cider to the ginger and molasses the taste is bold and spicy. I know of four young grandsons who would love to have them as a treat. I LOVE cooking with boiled down apple cider. The flavor gets so beautifully concentrated and it’s perfect for baking and any dish really where you want that depth of cider flavor. These cookies are beautiful! I’m such a fan of any cookie with crackles like that, especially with both a snap to the texture, and chewy. These wouldn’t last long in my house!